The time between conceptualizing a vegetable garden until the first opportunity for harvest is both wonderful and challenging. It’s hard not to go out everyday and peer impatiently, first at carefully gathered piles of dirt, then at tiny green shoots, and then at the first glimmers of color that tell you that you have actually made your own food. What was once as much a part of daily life as eating itself is now such a novel process to some of us that the idea of the first harvest has taken on the significance of a holiday. 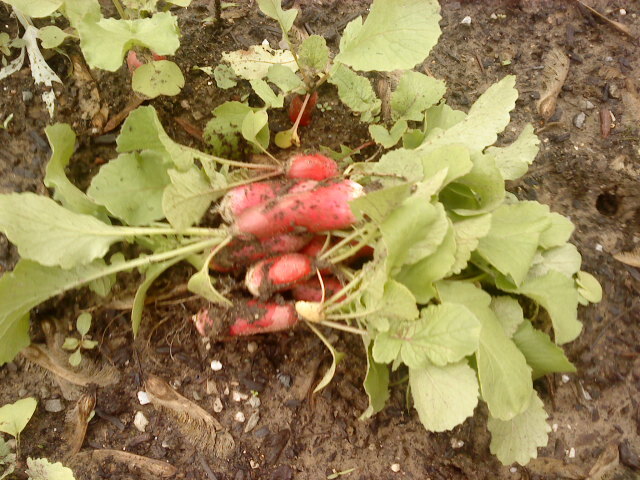 Which is why today was so exciting: I pulled up 9 radishes! I could have pulled more, but thought I’d space out this harvest since radishes get bitter so quickly after they leave the ground. Pulling the first was exhilarating; we’ve been cutting lettuce leaves and herbs, but actually pulling something from the ground seemed to make the whole experience more real. We grew the “French Breakfast” variety. Radishes are fun members of a garden, as they mature quickly, and their cute little tops poke out of the ground and start pushing up as they grow. 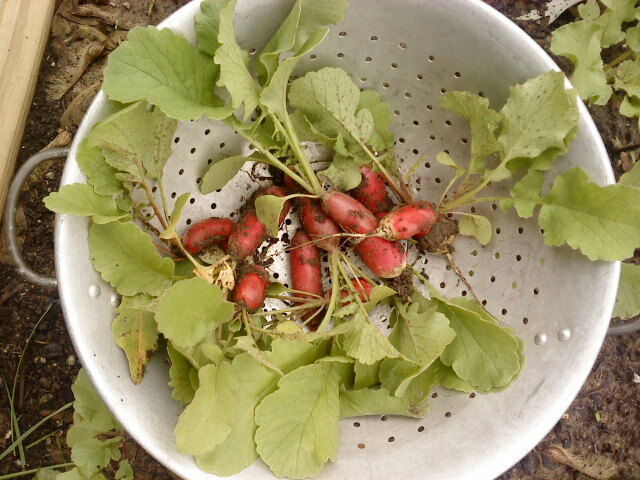 Through repeated plantings, you can have multiple radish harvests per season. I’m so excited about how easy they are to grow and how quickly they are ready! I believe I’ll go and pick out a few more seed varieties for subsequent plantings. I can’t wait to see the different colors and experiment with the different degrees of pepperiness. I plan to use the greens in salads, and to try a few cooking techniques for the roots, though I’m sure most will be eaten raw. We’ve got some great bread in the kitchen; maybe I’ll try the Dutch breakfast of sliced radishes on bread and butter — YUM! We had already planned on having Greek food for dinner. According to the CDC, “Radishes were so highly regarded in Greece that gold replicas were made,” (http://www.fruitsandveggiesmatter.gov/month/radish.html). Don’t you just love synchronicity?